Last Friday night we started the Anniversary Celebrations by eating at Texas de Brazil. (My meat-eating family would have been ashamed at the pitiful lack of meat I put away.) It was ALL wonderful but I think my favorite part was just the presentation of the Gouchos bringing all that meat to the table on skewers. Oh, and the "Salad" Bar was absolutely amazing! 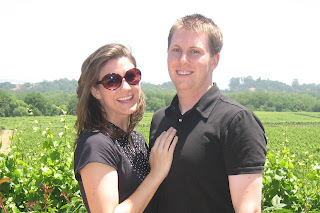 After our dinner, Ben and I went to see Shrek the Third (hence the title to this post). It was just as good as the first two, but both of us were so tired after gourging ourselves at TdB that we should probably see it again soon. For the Big To Do.... Ben and I went to the Wine Country in California. We decided we wanted more of the "authentic" winery style so we settled in West Sonoma County in the town of Guerneville, CA. 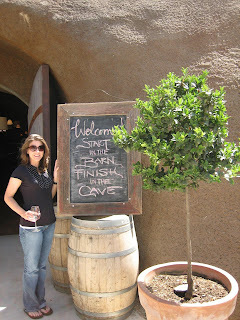 While we were there we visited several wineries including, Korbel, Gary Farrel, Moshin, Rochiolo, Belvadere, Bella Wine Caves, Ferrari, Stryker, Kendall Jackson, and Iron Horse. We took a tour at Korbel since neither of us understood the difference in the process for making Champagne. We learned quite a bit and got to sip on some wonderful wines. We arrived in Oakland, CA on Sunday and took the scenic drive up HWY CA-1 along the coast. We took our time and stopped frequently to enjoy all the different landscapes. California really does have it all: beachs, mountains, rolling plains. Whatever it is you love, CA's got it! 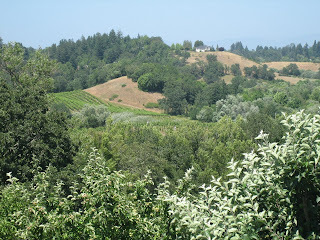 We stayed at a cabin resort called West Sonoma Inn in Guerneville, CA. Our room was wonderful with a private balcony and hot tub overlooking nearby vineyards and mountains. We were very surprised to find that the cabins had no air conditioning but soon found out why. The weather was PERFECT. It was cool (like 50 degrees cool) in the morning and the evenings and warmed up to a comfortable 75 degrees in the late afternoon. The room was equiped with a fireplace that was controlled by thermostat for those cool evenings. 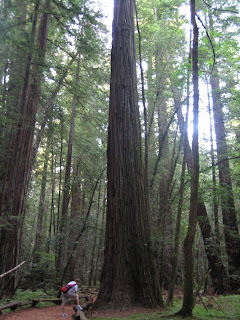 We also had the priviledge to visit the Armstrong Redwood Forests. The first day we visited the reserve, we hiked along trails and enjoyed the majestic giants. We were so amazed that we returned a second time and drove along the pathway designed for cars. We wound our way to the top of a beautiful mountain and enjoyed looking down on the tree covered valley. Redwoods can be found throughout Sonoma County but a large majority were cut down in the early 1900's. So to enjoy the trees in their natual forest state, you have to visit a reserve such as Armstrong. Another wonderful thing about Sonoma County... The Farmer's Markets. We were able to stop and pick up fresh fruits, veggies, and cheese to snack on throughout the day. On our way home we stopped in San Francisco to visit Pier 39 and the Fisherman's Wharf. A trip to CA wouldn't be complete without a quick stop in San Fran. We didn't have enough time to really explore there but caught glimpses of the cable cars, the steep streets, and the Golden Gate Bridge. We can't wait for another trip to learn more about the city.